Yesterday I made chili in the crock pot. What I did was, I threw the kidney beans into the crock in the morning, along with water to cover by about an inch, and a chopped-up onion, and a chopped-up green pepper. When I came home I took a skillet and cooked up some ground beef and another onion and some spices and then I tossed the contents of the skillet into the crock pot. That is as close as I can come to making dinner in advance. I kind of made that recipe up because it occurred to me today how fussy I am about crock pot recipes. I do not like recipes that toss all kinds of garbage-y stuff into the crock and expect it all to work out. On the other hand I do not like recipes that make you do all this prep work, brown the meat, de-glaze the skillet, combine this, do that. I have a whole slow cooker cookbook like that and it drives me crazy. Also! I do not like recipes that tell you to fuss with the thing every two hours. Zut alors, if I wanted to watch over the thing, I would just cook on the stove top, you know? 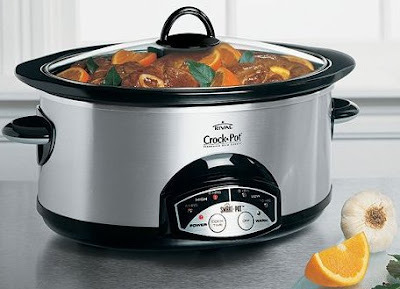 I cannot believe I invested in a crock pot when I was in California. I cooked for Leonard Pennario in that crock pot. I get misty remembering that! Tomorrow I am looking for a recipe in a slow cooker that calls for mushrooms. I picked up all these mushrooms over the last couple of days. Once I even got into a fight over them. That was at Jubilee! Normally I like Jubilee. This is the Jubilee at the corner of Kensington and Harlem. I do not know if there are any others. They have these great ads that squawk over the sound system for the Harlem Helpers. My brother George and I always laugh about that. It is like going back to 1950! Back to my experience with the mushrooms. The mushrooms were two eight-ounce packages for $3 and I picked up two of them. I get to the checkout. The kid squints at the mushrooms. Then he asks the kid at the next checkout, "How much are these?" The kid says: "Two dollars." I spoke up humbly. "Excuse me," I said. "They're two for three dollars." The first kid, my checkout kid, then turns to this weedy gray-haired guy who is the manager. At least that is what I think from repeated visits to this Jubilee on my way to see my mother. The manager grabs a pack of mushrooms and says he will go and check. At no time did anyone meet my eyes or address me at all! The manager comes back after a few minutes and his answer is to swipe a pack of mushrooms across the scanner. Sure enough, it scans to the price I had said, two for three dollars. So that is what I paid. Again, at no time did anyone say a thing to me. No, "Sorry for the delay." No, "Sorry we couldn't take your word for that." No: "OK, you were right." Nothing! Slugs and oiks! They are everywhere! I keep meaning to start an album of them. That way when someone is sluggy to us we can take the person's picture and preserve it. Instead of getting mad, we can think, "This is my lucky day! What a fine specimen I have found." So today, what to do with these hard-won mushrooms. It's got to be something good! As we rarely see each other, should I send you my portrait for your gallery? I know few people, Mary, who would get misty over a crock pot. Mushrooms? Something good to do with them? Feed them to the dog! Those things are bad to eat for they are neither plant nor animal and have characteristics of both. What they are, is aliens! LOL Like, from outer space. Not of this world. Hey, I cooked a pot of chili the other day as well. My first cooking adventure in many years (except for baking frozen pizzas). It was so awesome! I even wrote down what I did so I can do it again one day! Budd, I get misty over a crock pot! I sure got misty when I ate that chili I made. Those onions! Larry, send us your Crock Pot Chili recipe! We have to post it as Larry's Chili. What do you expect at that store other than slugs and oiks? I remember when it was a Bells market and everyone knew it as "Dirty Bells." I visit that Jubilee on occasion -- but usually avoid it. another reason to shop at wegmans! Dirty Bells? I never heard that!! I knew the Gay Bells and the Singles Bells but not the Dirty Bells. AHAHAHA! Before Bells it was an A&P. Bet you don't remember that. I've found that the dirtiest stores have the best deals. That's why I hardly ever shop at Wegmans. I've been to the Harlem Rd. Jubilee, and in the grand scheme of things, it's not all that dirty. My favorite store is "The Market" on Tonawanda Street. It's half the size of the Harlem Rd. Jubilee, and twice as dirty. You can get a 2 lb. bag of onions for 69 cents, a 10 lb. bag of potatoes for $1.89, and low meat and deli prices. As an added bonus, they always neatly tie up their pork roasts. Ryan, at the dirty Jubilee, they had 3 pounds of onions for 79 cents. Did I really say that? I am turning into my mother. "Larry, send us your Crock Pot Chili recipe! We have to post it as Larry's Chili." Sorry, but I have never owned a crock pot. This chili was made in a... a what?... a 'soup pot' looking thing with a handle on each side and, it has a lid. Guess this is the old-fashioned way to cook chili, lol. However, if you would still like my recipe, just ask. An Allentown dweller used to refer to the Bells on Elmwood at Summer as "Tinker Bells". I'm starting to think that maybe I'm not the expert at finding bargains. You always seem to outdo me! First the roasting chicken, now the onions. Well, I just have to remember that the extra gas I'd use to drive all the way out to Dirty Jubilee would negate any savings on the onions. Larry, I still want that recipe! And Ryan, you are still the master. You are the Leonard Pennario of food shopping and I bow before your expertise. With which, there are 2 items that I cannot seem to find cheap: maple syrup, and raisins. Any ideas? Prof. G ... Tinker Bells ... I am going to be laughing about that all day. "Larry, I still want that recipe!" Sure. Should I post it here or email it to you?